* selected more than 60 days, discounts are discussed individually. 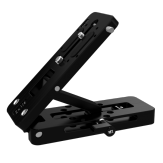 Slidekamera HSK-5 slider is a professional equipment perfect for smooth shots during the camera movement. Suitable for light cameras and photo cameras of a total weight up to 15kg. 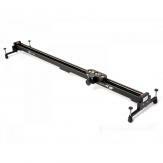 Slider was designed basing on high quality components, what guarantees excellent smoothness and stability of motion. It is also equipped with a level and a standstill brake. There is a possibility to remove the standstill brake and mount other accessories instead, for example electric drive. The 3/8" hole built-in in the cart plate allows to mount devices with either 1/4" or 3/8" thread on the cart with the use of a proper reduction. 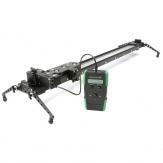 Slidekamera HSK-5 1000 Basic slider is a professional equipment perfect for smooth shots during the camera movement.